"Somarama Thero had used a .45 Webley Mark VI revolver to fire the six shots including the fatal ones"
"Bandaranaike who thought of himself as a “popular people’s Prime Minister” felt a sense of embarrassment at being protected by many policemen"
"A state of Emergency was declared at 11 am on Sep 25th by Governor General Sir Oliver Goonetilleka"
The three-decade period of intense conflict from 1983 to 2009 has resulted in hundreds of political assassinations in Sri Lanka. Both Tamil and Sinhala armed groups have been responsible for these killings at different times and diverse locations. The killings of those who held or were holding high political office were so numerous during those times that most people lost count of such assassinations. Among those assassinated were an executive President, a leader and former leader of the opposition, cabinet ministers and ex-cabinet ministers, Parliamentarians and former Parliamentarians, provincial council ministers, ex-heads of district councils and local authority heads. A head of state survived an assassination attempt but lost an eye. Though political assassinations became a regular feature when the armed secessionist conflict in the North –East or the attempted insurrection in the South were in progress, the first ever assassination of a major political personality experienced by the Island nation was much before those violent phases occurred. Fifty-five years ago on September 25th 1959 the Prime Minister Solomon West Ridgeway Dias Bandaranaike, (SWRDB) of Sri Lanka known as Ceylon then was shot and seriously wounded by a Buddhist monk. Prime Minister SWRD Bandaranaike succumbed to his injuries and passed away the following day. Therefore September 26th 1959 got etched as an important date in the post-independence history annals of Sri Lanka. Against the backdrop of myriad assassinations during the conflict the solitary assassination that occurred 55 years ago may seem insignificant to some. What has to be remembered is that the incident was the first of its type in independent Sri Lanka. The impact of that single assassination was tremendous at that time.Besides the political background to that assassination is of relevance in the current context too. It is pertinent therefore to delve into that assassination and its aftermath fifty –five years later. SWRD Bandaranaike as Premier was officially ensconced in the Prime minister’s official residence “Temple Trees” at Galle Road, Kollupitiya. Bandaranaike also divided his time between the ancestral manor at Horagolla Walauwe and his private residence “Tintagel” at 65, Rosemead Place, Colombo 7. SWRDB was at “Tintagel” on the fateful Friday he was shot. A Buddhist monk named Ven. Talduwe Somarama Thero was among those who came to meet Bandaranaike on the morning of September 25th 1959.It was a Friday. The monk was a lecturer at the Govt College of Ayurveda or indigenous medicine in Borella. Somarama Thero who was attached to the Amaravihare.He also had an Ayurvedic eye clinic in Borella.The ostensible reason for the monk wanting to meet the PM was to appraise him of requirements for the Ayurveda college. Talduwe Somarama’s name at Birth was Talduwe Ratugama Rallage Weris Singho. He was born on August 27th 1915 to Ratugama Rallage Dieris Appuhamy and Isohamy. Weris Singho was educated at the Talduwe Ihala school and in Dehiowita. He donned the yellow robes on Jan 20th 1929 at the age of fourteen. Somarama was ordained in Kandy on June 25th 1936 at the age of twenty-one. The premier of the nation was in the front verandah of his house meeting people who had come to see him. One batch of people was accommodated inside while others stood in line outside awaiting their turn to go in. Talduwe Somarama also waited patiently in the queue for his turn and then was admitted in.There was a group of about 20 persons inside and a queue of around 40 outside. SWRD Bandaranaike was proud of having ushered in the age of the common man. His Govt was regarded by the masses as “Apey aanduwe” or our Government. One manifestation of this was the easy access the people had to their prime minister. Somarama Thero sat on a chair at one corner of the verandah.He had placed a file and a handkerchief on a low stool by his side on his left. Seated on his right was another Buddhist monk from Polonnaruwa named Ananda Thero. The Polonnaruwa monk accompanied by some farmers had come to see the prime minister on a matter concerning the appointment of a cooperative society manager.Ananda Thero was later to prove to be a key witness at the trial. As each person’s name was announced he or she walked up to the Prime minister , paid obeisance and articulated their woes and views.However when Somarama Thero stood up as his name was announced , Prime minister Bandaranaike himself got up respectfully, walked up to him and bowed reverentially as was the custom in greeting a Buddhist monk. He then asked the monk what he could do for him. Somarama - who seemed tensed up according to Ananda Thero - told the PM that certain improvements were needed at the Ayurveda College. Bandaranaike then replied that he could get the Health Minister AP Jayasuriya to attend to it if the venerable monk stated the requirements in writing and submitted it to him. The time then was 9.45 am.Somarama Thero sat down and fumbled with the file on the stool by his side as if he was going to pull out a memorandum to be given to the Prime Minister. As the PM was getting ready to receive what he may have thought were some papers, the Buddhist monk took out a pistol concealed in his robes and fired twice at point blank range hitting Bandaranaike in the chest and abdomen.The Prime Minister made a loud sound like a gasp or moan and went down.He then got up slowly and with great difficulty tried to stagger back inside the house. When a shocked Ananda Thero got up from his chair ,a thoroughly excited Somarama then stood up and pointed his gun at the priest from Polonnaruwa. An agitated Ananda Thero shouted “Ammo”(mother). Somarama then turned around and followed Bandaranaike, shooting at him wildly. He fired four more shots thus emptying the chambers. One bullet injured the Prime Minister’s hand.Another hit a school teacher named Gunaratne who had also come to see the Prime Minister on that morning. A third shot smashed the glass pane on a door.The fourth struck a flower pot breaking it. Somarama Thero had used a .45 Webley Mark VI revolver to fire the six shots including the fatal ones. Meanwhile there was pandemonium as people on the verandah started scattering here and there in fear. Ananda Thero ran out and shouted to the policeman on duty at the gate that a monk was shooting at the PM. The policeman who had already started running towards the house upon hearing the shots came inside and fired at Somarama Thero injuring him in the thigh. Realising what had happened ,enraged people now surrounded Somarama who was shouting excitedly that he had done so for the “country, race and religion”. After a scuffle in which Somarama was manhandled by the people , the monk was formally arrested. The furious crowd may have mauled the monk but for the merciful intervention of Bandaranaike.The bleeding Bandaranaike lying on the floor had urged the people not to harm the monk in any way.The apprehended monk was taken away by the police to the Harbour Police Station amidst tight security. SWRD Bandaranaike was rushed to the General Hospital at Borella and taken to the operating theatre . "November 26th 1959 saw seven persons being charged in the Chief Magistrate’s Court of Colombo on a charge of conspiring to murder SWRD Bandaranaike"
Tragically ,Bandaranaike never suspected any threat to his person and was unbelievably unconcerned about security. Given the levels of security available to VVIP’s today it is mind boggling to know that only a police sergeant was in charge of the Prime Minister’s security 55 years ago.Even the sergeant in charge was not on duty that morning.Only a constable had been at the gates. When attempts were made by concerned police officials to provide Bandaranaike with a personal bodyguard, Bandaranaike had reluctantly agreed. A police sub-inspector was assigned. However Bandaranaike asked him to go back after a few days saying that a sub-inspector should attend to more important duties and requested the IGP to assign a few police constables instead. Parliament was in session at Galle Face when news of the assassination attempt reached the house.Education Minister Dr. W.Dahanayake who was to later succeed Bandaranaike as Prime Minister later wanted Parliament to be adjourned but the majority of the honourable members disagreed.Opposition leader Dr. N.M. Perera stated “there was no need to panic”.Several Ministers and MP’s from both the Govt and opposition left the house and made a beeline to Borella to see how the Premier was faring. The Governor General of the time was Sir Oliver Goonetilleke. When news reached him of the shooting incident Sir Oliver was at “Queens House” swearing in the new Italian Ambassador Count Paolo di Michelis di Sloughhello. Sir Oliver stopped the ceremony and rushed to Rosmead Place.Thereafter he sent a message to Parliament that it continues to function in a “business as usual”manner. The Governor General known and respected for his political wisdom and statesmanship took the initiative of declaring a state of emergency as a precautionary measure. It may be recalled that it was Sir Oliver who acted decisively and declared emergency in May 1958 when anti –Tamil violence erupted in a situation where Prime minister Bandaranaike vacillated. A state of Emergency was declared at 11 am on Sep 25th by Governor General Sir Oliver Goonetilleka and Army, Navy and Air Force units including volunteers were mobilised and placed in readiness throughout the island throughout the island. Later events demonstrated that Sir Oliver’s anticipation of trouble and resultant declaration of emergency was indeed commendable. 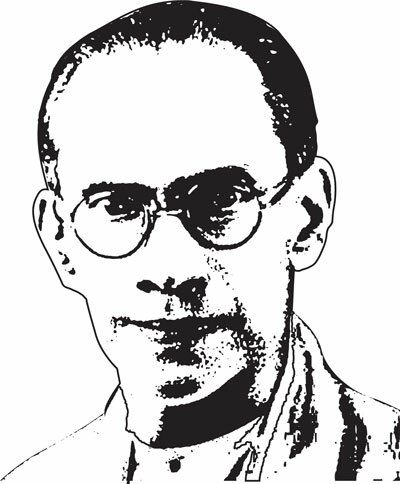 What happened was that Bandaranaike after surgery was admitted to the Merchants’ Ward.He issued a message to the nation from his hospital bed in the Merchants Ward.In the message the PM was extremely magnanimous towards the man who had shot him.Instead of referring to him directly as a Buddhist priest,SWRDB described him “as a foolish man dressed in the robes of a monk”. The Premier also called upon the government and authorities to “show compassion to this man and not try to wreak vengeance on him”. This well-intentioned magnanimity may have had unintended, dangerous consequences but for the prompt action of Sir Oliver Goonetilleke who had declared emergency before the statement was issued.Anticipating another round of 1958 type of violence the Governor General issued strict instructions to the Police to be vigilant against any sign of violence erupting. Given the prevailing political atmosphere of the time where anti-Tamil feelings were running high the immediate suspicion was that the assassin was a Tamil. News began spreading that the name of the man who shot the premier was “Somaraman”. A Tamilised version of Somarama.So when Bandaranaike spoke of a “man dressed in the robes of a monk” rumours started to circulate that that a Tamil had dressed up as a Buddhist priest and shot the Prime Minister. Tamils in Colombo were very nervous then but thanks to the police being vigilant nothing untoward happened.Thanks to Sir Oliver the media was “advised” to reveal very clearly without delay that the assassin was not a Tamil. The anti-Tamil feelings began subsiding. A replay of the 1958 violence was averted at that point of time. Early signs after the surgery seemed rosy.The Prime Minister had recovered consciousness a few hours after the operation and was cheerful. He had joked with the doctors and nurses around his bedside. He had asked one of the nurses “How am I doing?” She replied “You are doing fine, Sir”. “Yes, I am an old man and have undergone a five hour stomach operation but I still have guts,” the PM had declared. He had also dictated a message to the nation from the hospital. Things however took a turn for the worse in the early hours of the morning. Three senior doctors - Dr. P. R. Anthonis, Dr. T. D. H. Perera and Dr. M. J. A. Sandrasagara were on hand doing their best but there was no improvement. The fourth Prime Minister of Independent Ceylon passed away on September 26th 1959 exactly twenty-two hours after he had been shot. The official Bulletin issued after his death stated as follows “The condition of the Prime Minister suddenly took a turn for the worse at about 7 a.m. There was a sudden alteration of the action of the heart and his condition deteriorated very rapidly. He passed off peacefully about 8 ‘O’ clock.”It was signed by Dr. P. R. Anthonis, Dr. T. D. H. Perera and Dr. M. J. A. Sandrasagara. As news of the investigation into the killing was published in the newspapers and a wide range of conspiracy theories started floating. They gathered momentum with suspects being arrested and charged. The accusing finger was pointing inwards to prominent Sinhala personalities. The important question however was the reason for the assassination. Why did Talduwe Somarama assassinate the Prime Minister? Who were the people who conspired to kill Bandaranaike ? In order to obtain a proper understanding it is necessary to briefly examine some of the events prior to the assassination. The Parliamentary election of 1956 was a watershed in the political history of this Island nation. The United National Party (UNP) that was in power from 1947 was defeated .The Sri Lanka Freedom Party led by SWRD Bandaranaike swept the polls as part of a coalition known as the Mahajana Eksath Peramuna (MEP). Bandaranaike became the Prime Minister of Ceylon. The MEP coalition was an assorted mix of different political persuasion. There was also in broader terms a division along the traditional right-wing and left- wing politics. The “Boralugoda Sinhaya” Philip Gunewardena commanded the leftists while the duo comprising “Minneriya Deiyo” CP de Silva and “Banis Maamaa” Wijayananda Dahanayake led the rightists.The right-wingers in the party were worried about the ascendancy of the left in government and party and began plotting a reactionary counter-strike. The aim was to drive out or undermine the leftist tendency within MEP folds. The dynamo behind right-wing machinations was a charismatic Buddhist prelate , the Venerable Mapitigama Buddharakkita Thero who was the Viharadhipathy or Chief Incumbent of the historic Kelaniya Rajamaha Vihara.The priest’s influence was mainly due to his politics. He was the founder and secretary of the Eksath Bhikku Peramuna (United Bhikku Front) representing politicised sections of the Buddhist clergy. The Bhikku Front played a crucial role in mobilising support for the MEP during the 1956 elections. Contrary to tenets of the “Vinaya”, Buddharakkita Thero had also discreetly dabbled in commerce and had large sums of money at his disposal. The powerful priest had spent lakhs of rupees for the MEP election campaign.His clout therefore was massive with the government and was in a sense the Rasputin or Richelieu of Sri Lanka. He was also a hawkish communalist and spearheaded the campaign against the Bandaranaike-Chelvanayagam pact. Hundreds of Buddhist priests demonstrated against it thereby compelling Bandaranaike to abrogate it unilaterally. Buddharakkita Thero was the mastermind behind the protest. Despite Buddharakkitha Thero’s influence ,SWRD Bandaranaike was not prepared to bow down to the powerful monk’s diktat.Irritated by this, the “kingmaker” priest now decided to remove Bandaranaike altogether.The flashpoint causing this change of mind was not race,class or ideology.It was sordid commerce. Two issues rankled.One was the Prime Minister’s refusal to hand over a lucrative shipping contract to a company named Colombo Shipping Lines that was co-founded by Buddharakkita in the name of his associate HP Jayawardena to import rice from Burma (Myanmar) and Thailand. The second was a licence to start a sugar factory costing many crores of rupees.SWRD acting on the advice of Philip Gunewardena and RG Senanayake had refused to give the contract to the company resulting in great financial loss to Buddharakita and his frontman Jayawardena.He had also denied a sugar manufacturing licence. Thus Buddharakkita along with Jayawardana conspired to assassinate Bandaranaike. Their unwitting instrument was Talduwe Somarama Thero who was an ardent Sinhala Buddhist nationalist. Being highly emotional Somarama was easily manipulated by Buddharakkita who convinced him into believing that the PM was a traitor to the country,race and religion and therefore should be eliminated. Somarama was a mere cat’s paw. The tripartite forces that campaigned effectively for Bandaranaike in 1956 were Buddhist priests, Ayurvedic medical practitioners and teachers. It was said that “Sanga, Veda and Guru” were responsible for installing Bandaranaike as Prime Minister.The bitter irony was that Bandaranaike’s assassin was a “three-in-one” personality representing all three. Somarama was a Bhikku , an Ayurvedic doctor and a lecturer in the Ayurvedic college. The tripartite forces that brought SWRDB to power were now personified in the man who killed him. After Bandaranaike’s death, the Education Minister Wijayananda Dahanayake was sworn in as Prime Minister. The new PM committed a grave blunder without realising its implications.Since Buddharakkita Thero was a powerful force behind the throne and an influential figure in the country , Dahanayake tried in his own way to ingratiate himself with the Bhikku.Little realising that Buddharakkita was the evil genius behind the assassination, the new Premier got the priest down to Temple Trees and arranged for an address to the nation over “Radio Ceylon” on Bandaranaike. The notorious underworld figure Ossie Corea was also arrested. Ossie Corea who had at one time been working as an excise inspector was later an arrack renter and kasippu merchant .Interestingly it transpired during the trial, that the gun used by Somarama was from Ossie Corea’s personal arsenal of six firearms. Also Ossie had shaved his head bald at the time of the assassination. This fuelled the rumour that it was Ossie Corea disguised as a Buddhist monk who had killed Bandaranaike.But subsequently Ossie Corea was also discharged. The Finance Minister of the time, Stanley de Zoysa was also a casualty. His brother FR de Zoysa a businessman was also one of the suspects. When FR de Zoysa was arrested on November 21st, his brother Stanley resigned his portfolio on Nov 23rd.Another brother Sydney de Zoysa who was senior DIG of Police was sent on compulsory leave. But FR de Zoysa though arrested was cleared of suspicion and released. Sydney was re-instated by Dahanayake as secretary of a newly set up Internal Security Ministry. In a sensational development Mapitigama Buddharakkita Thero was arrested on October 20th. This immediately caused pressure to be mounted on former Health Minister and current Local Government Minister, Vimala Wijewardene to resign. Mapitigama Buddharakkita Thero was regarded as being very close to Vimala and had supported her politically in her polls campaign.Though a kinswoman of JR Jayewardena, Ms. Wijewardene had contested against her nephew by marriage in the Kelaniya electorate in 1952. Buddharakkita Thero had spent 60,000 rupees (a princely sum those days) for the campaign though she lost. In 1956 the Thero had spent more than a lakh for her successful campaign in the Mirigama constituency. The relationship between Vimala and Buddharakkita was the subject of several scurrilous pamphlets and sensational tabloids. Both had allegedly complained to Bandaranaike urging that action be taken to stop them. But SWRDB refused to do so and this fuelled resentment against the Prime Minister.So when Buddharakkita Thero was arrested there was suspicion that Vimala too was involved in the conspiracy and should resign. But when Dahanayake asked her to resign the lady refused saying she was innocent. Finally when she was arrested on November 21st , Dahanayake had no choice other than to dismiss her from the Cabinet.In fairness to Vimala it must be noted that her innocence was subsequently proved and cleared of complicity in the crime. Detectives from Scotland Yard in Britain were brought down to assist the Ceylon Police in the investigations.The then DIG of the CID, D.C.T. Pate, SP Rajasooriya, SSIK Iyer ASP,,IP Abeywardena, IP AM Seneviratne and IP Tyrell Goonetilleke were responsible for the intensive Police investigation. In addition to this Somarama Thero the fourth accused was also charged with commitment of murder. Incidentally, Somarama Thero had confessed to committing the murder in his statements to the police and to the chief magistrate. However he changed his position at the Supreme Court trial. “I did not shoot the Prime Minister. It is untrue that the 1st and 2nd accused or either of them requested me to do so. If I said so to the magistrate, it is false. My statement to the magistrate was not made of my own free will. I am not guilty.”stated Somarama in the Supreme Court later. Within a short time the seventh accused AAC Amerasinghe(Kolonnawa urban councillor) received a conditional pardon in terms of section 283 of the Criminal Procedure Code and thereafter became a witness for the prosecution.Non-summary proceedings began and after a long magisterial inquiry , the sixth accused Vimala Wijewardene was cleared of all charges of conspiracy and deemed innocent of any complicity. She was discharged on July 15th 1960. Her political career had effectively ended and in later years became religiously inclined and was a regular participant of Christian revival meetings. The magisterial inquiry under Colombo Chief Magistrate N.A. de S. Wijesekara went on for 124 days with 193 witnesses testifying. The Chief Magistrate committed the first five accused to stand trial before Supreme Court on charges of conspiracy and murder. The Supreme Court trial began against the five accused on 22nd February 1961 before Justice TS Fernando QC OBE . The foreman of the seven member English speaking jury was DWL Lieversz Snr. Ninety-seven witnesses testified and were cross examined. The Solicitor-General AC Alles along with Deputy Solicitor General A C M Ameer conducted the case on behalf of the prosecution with Senior Crown Counsel R.S.Wanasundara and R.I. Obeyesekera assisting. The first accused Buddharakitha Thero and second accused Jayawardene were able to retain reputed British Queen’s Counsel, Phineas Quass to defend them.The third accused Anura de Silva’s lawyer was Kenneth Shinya who was assisted by K.Ratnesar.The fourth accused Somarama Thero was defended by Lucian G.Weeramantry who appeared free of charge for the Bhikku. N. Satyendra son of eminent Queen’s Counsel S. Nadesan appeared for the fifth accused Newton Perera.Satyendra was assisted by A. Mahesan. The third accused Anura de Silva was acquitted with the jury voting unanimously in his favour. The fifth accused Newton Perera was acquitted on a divided verdict with five voting in favour of the accused and two against.The trial concluded on May 12th 1961 after fifty-five days of hearing. The proceedings were well publicised and extensively reported in the media. Within five days the Jury returned its verdict. It may be recalled that a dying Bandaranaike had urged compassion be shown to his killer. Contrary to his wishes the SLFP regimes in power under both Dahanayake (1959-March 60 ) and Sirima Bandaranaike (1960 July – 1965)displayed a terrible vindictiveness rather than bestowing clemency upon the condemned. When SWRD Bandaranaike was Prime Minister his government had passed the suspension of the Capital Punishment Act No 20 of 1958.This led to the death penalty being suspended from May 9th 1958.In the aftermath of Bandaranaike’s assassination the Dahanayake government revised its stance hastily.Within a week a gazette extraordinary proclamation dated October 2nd 1959 re-introduced the death penalty. This was to impose maximum penalty on those responsible for the assassination. However even the best laid plans of men and mice turn awry.Though all three convicted persons would have had to face the death penalty there was a legal loophole that helped Buddharakkita and Jayewardene. Before the suspension of the Capital Punishment Act was passed even those guilty of murder and a murder conspiracy had to face death as punishment. But Section 2 of the Suspension Act ensured that capital punishment not be imposed for the murder offence and conspiracy for the commission of murder.The punishment was reduced to a maximum of life imprisonment. In its haste to repeal the Suspension Act and re-impose the death penalty with retrospective effect the Dahanayake regime had made a slip. While the repeal act specifically provided for sentence of death for a person convicted for murder committed prior to December 2nd 1959 there was no similar provision made specifically for the offence of conspiracy to commit murder. All three convicted persons appealed against their death sentence to the then Court of Criminal Appeal. The five Judge bench presided over by Chief Justice Hema H. Basnayake comprised - Justices MC Sansoni, HNG Fernando, N. Sinnetamby and LB de Silva. The prosecution team was led by a lawyer from the unofficial bar, George E. Chitty, QC, who was specially retained by the Attorney General. This arrangement was opposed by Deputy Solicitor General Ameer who resigned in protest. (Ameer was later appointed Attorney General by the Dudley Senanayake Government of 1965-70).George Chitty was assisted by LBT Premaratne QC and Crown Counsel Ananda Pereira. It was argued on behalf of Buddharakkitha and Jayewardena that the maximum punishment for the offence of conspiring to commit murder was rigorous imprisonment for life. E.G.Wickremanayake, QC, submitted that the Act which re-introduced the death penalty for murder did not in specific terms re-introduce such penalty for conspiracy to commit murder. The Criminal Appeal Court concurred with the submission.The appeal of all three were dismissed but courts amended the sentences imposed on Buddharakkitha Thero and Jayewardena from death to rigorous life imprisonment. Thus both of them were saved from the gallows due to this legal loophole. Meanwhile all three convicted persons resorted to have their verdicts reversed by the Judicial Committee of the Privy council in the UK. Applications for special leave to appeal to Her Majesty in Privy Council by all three convicted persons were refused by an order of the Privy Council in May 1962. Sir Dingle Foot QC, appeared on an honorary basis for Ven. Somarama, at the final appeal before the Judicial Committee of the Privy Council. Talduwe Somarama Thero prepared himself to face death.He thanked in open court his counsel Weeramanthri who appeared free for him “I thank my counsel who defended me at this trial like a true lion.”Weeks before his execution Somarama was converted to Christianity and was baptised in his cell by an Anglican priest.He was hanged in the Welikade gallows on July 6th 1962 at the age of 48. The hanging was undertaken by State Executioner Lewis Singho and his assistant Subatheris Appu. The Dudley Senanayake Government of 1965 -70 on May 7, 1966 commuted the life imprisonment sentences of the 1st and 2nd accused to 20-years.However the 1st accused Mapitigama Buddharakkitha Thero died in 1967 of a heart ailment aged 46-years after having served time at Welikada prison for 71/2-years of his sentence.The 2nd accused Hemachandra Piyasena Jayawardena served 171/2-years of his sentence and was released on August 4, 1977. 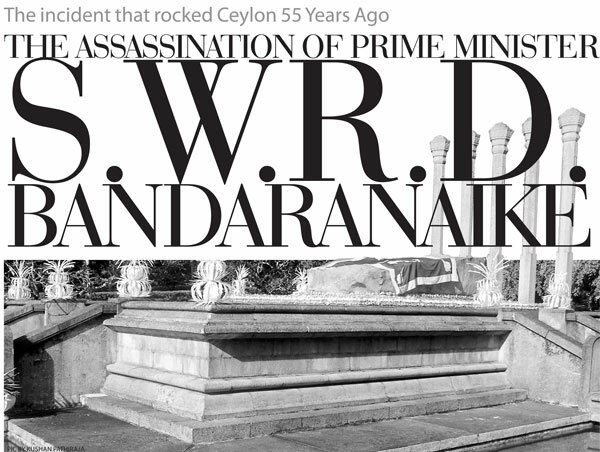 In 1963 the Sirima Bandaranaike government appointed a commission of inquiry under the provisions of the Commissions of Enquiry Act to probe on the political aspects of the SWRD Bandaranaike assassination. Justice TS Fernando,Justice Abdel Younis from Egypt (UAR) and Justice GC Mills-Odich from Ghana were the commissioners. After perusing earlier material and questioning more witnesses the commission released a report as sessional paper III of 1964.The only adverse finding in the report was against Vimala Wijewardena who had been discharged in 1960.